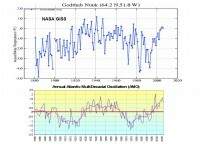 As part of a four part series on the ocean’s multidecadal cycles and their importance to climate on Intellicast.com, the last two weeks we showed how the natural multidecadal cycles in the Pacific (called the Pacific Decadal Oscillation or PDO) and Atlantic (called the Atlantic Multidecadal Oscillation or AMO) affected the frequency of El Ninos and La Ninas and combined to correlate strongly with temperatures over the United States. In part III this week, we discuss temperatures and ice in Greenland and the Arctic, topics sure to dominate the news this summer. 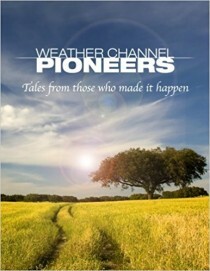 Already recent media stories have some scientists predicting another big melt this summer. We will show how that is not at all unprecedented (happens predictably every 60 years or so) and is in fact entirely natural. Temperatures were warmer in the 1930s and 1940s in Greenland. They cooled back to the levels of the 1880s by the 1980s and 1990s. In a GRL paper in 2003, Hanna and Cappelen showed a significant cooling trend for eight stations in coastal southern Greenland from 1958 to 2001 (-1.29C for the 44 years). The temperature trend represented a strong negative correlation with increasing CO2 levels. Shown below is the temperature plot for Godthab Nuuk in southwest Greenland. Note how closely the temperatures track with the AMO (which is a measure of the Atlantic temperatures 0 to 70N). It shows that cooling from the late 1950s to the late 1990s even as greenhouse gases rose steadily, a negative correlation over almost 5 decades. The rise after the middle 1990s was due to the flip of the AMO into its warm phase. They have not yet reached the level of the 1930s and 1940s. 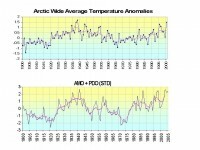 Warming in the arctic is likewise shown to be cyclical in nature. This was acknowledged in the IPCC AR4 which mentioned the prior warming and ice reduction in the 1930s and 1940s. Warming results in part from the reduction of arctic ice extent because of flows of the warm water associated with the warm phases of the PDO and AMO into the arctic from the Pacific through the Bering Straits and the far North Atlantic and the Norwegian Current. As was the case for US temperatures, the combination of the PDO and AMO Indexes (PDO+AMO) again has considerable explanatory power for Arctic average temperature, yielding an r-squared of 0.73. See much more with much peer review support for the ocean’s role in the Arctic and Greenland cycles of temperature and ice in the story here. In part IV, next week, we will address how both the Pacific and Atlantic control the strength, frequency and favored storms tracks for Atlantic tropical storms.